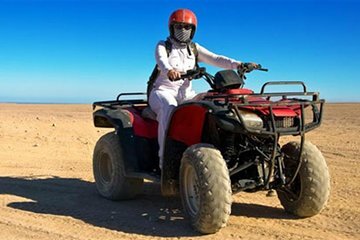 Pair ancient majesty with modern excitement on this ATV ride through the desert at the foot of the Giza Pyramids. Rev up your all-terrain vehicle for a unique way to take in the Great Pyramids and Sphinx, setting off at the cooler hours of sunrise or sunset in the best light for snapshots. Air-conditioned round-trip transport from your hotel and snacks make the trip comfortable no matter what the temperature.